Elevate is a Brain Training Android Application. It significantly helps us to boost up our brain power. This is the Best Brain Boosting Application. We get depressed many times, we are filled with tensions many times and in that situation, elevate can be a great option. We always want to make our brain active and we always want to b e the first one to answer the question. So, Elevate helps to improve our thinking and decision taking speed. 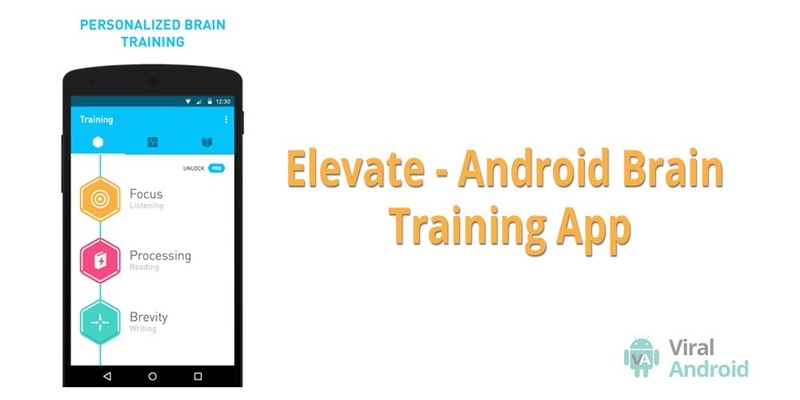 Elevate is the perfect brain training application. This application is designed to improve focus, math skills, listening skills, speaking skills, speed boosting and taking decision quickly. Its’ trainings are based on our skills. We can choose our skill level and according to that we will be asked questions and will be trained. We do not need special knowledge. In Elevate, there are simple and basic skills to advanced skills. This application is designed in a professional and an attractive way. The more time we spend with elevate to train our brain, the more our brain will be boosted, the more we will improve critical cognitive skills that are proven to boost productivity, earning power and self-confidence. After being trained with this brain training android application, we’ll have confidence to face difficult questions, IQ questions, etc. This is an application with collection of more than thirty programs which work like games. Those games give us fun and together with fun, they train our brain. We get fun as equal while playing other games. For the first or second time, it seems boring but after that we get full of joy and knowledge. If anyone has to tackle tricky problems, they should go through elevate. The games included in elevate falls under neuroscience and hence they are designed in collaboration with experts in neuroscience and cognitive learning. Its’ free and pro both the versions are available. Free version contains less number of games than pro version. Hence, elevate is the perfect application to train our brain. After using this, there will be slightly improvement in the brain capacity of any user. We use many good and bad applications but it is a better one. So, give it a try.